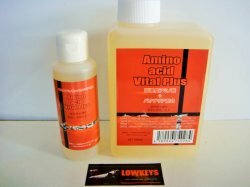 Amino acid Vital is bacteria combined 36 kinds of amino acids. This product boosts shrimps activation. Add 5ml Amino acid Vaital for 10L breeding water once a week.